Michelin’s innovative Active Wheel technology, along with other mobility-related innovations from the tyre manufacturer, will appear in the FoS Tech Pavilion at the Goodwood Festival of Speed next week. FoS Tech aims to showcase a ‘step into the automotive future’ with bold and exciting new concept cars and technologies from across the industry with a strong emphasis on environmentally friendly sustainable designs. These designs include a raft of alternative fuel vehicles, ranging from electric vehicles, plug-in hybrids and range extenders to innovatively powered bicycles and wheels. The Michelin Active Wheel is a standard wheel that houses a pair of electric motors. One of the motors drives and brakes the wheel and, whilst the other acts as an active suspension system to improve comfort, handling and stability. The system is powered by battery or fuel cell-powered electric vehicles and the technology is such that a vehicle equipped with it will no longer need a gearbox, clutch, drive shaft, universal joint or anti-roll bar. 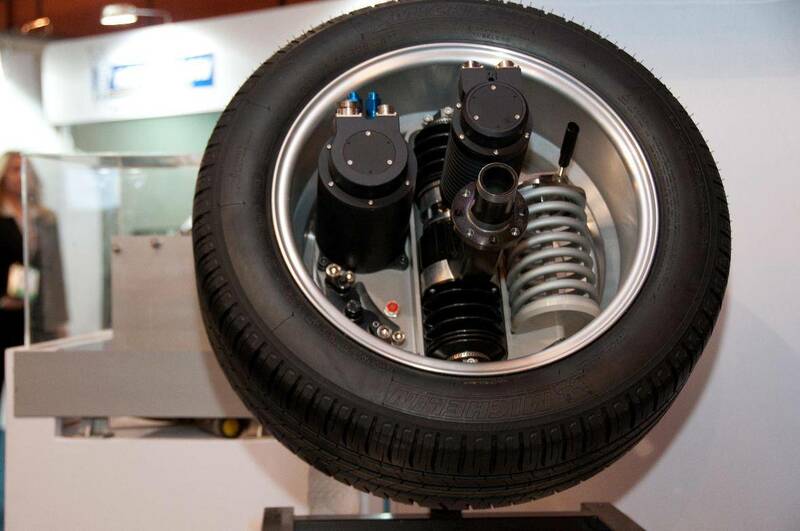 The Active Wheel provides direct power delivery of approximately 30 kW (40 bhp) as well as regenerative braking. In addition it replaces mechanical suspension with active suspension controlled by an in-wheel electrical suspension motor. Each wheel weighs 42kg and includes a 30 Kilowatt water-cooled drive motor of a similar size to a conventional starter motor. There is also a coil spring to hold the static load of the car and a small outer rotor disc brake. The wheel motor is attached to the vehicle chassis by a single lower control arm. Together, the two front wheel motors deliver an impressive combined 60 kW (81 bhp), which can peak at up to 120 kW (163 bhp) for short periods. In practice, the Michelin Active Wheel has the ability to remove the traditional engine under the hood, gearbox, transmission and suspension system, as all would be incorporated into the wheel technology. For a closer look visit FoS Tech at the Goodwood Festival of Speed, 28 June – 3 July 2012. Enjoy all things automotive! Motorsport, off-road, the new and the old. I've been lucky enough to make great friends though motoring, experience shows and motorsport around the world. « Kia named Best Car Manufacturer by Which?